I’ve never owned cast iron cookware nor have I ever cooked with it. I remember my Grandma June always raved about cooking with cast iron and how it made the food taste so much better. My grandma was an amazing cook. You know what though? Grandma June was right. Cast iron is pretty darn awesome and I’ve been missing out all these years. I should have listened to my grandma and tried it sooner! The fabulous cookware, bakeware and kitchenware store, Cilantro Cooks sells top quality products and it’s no surprise that I quickly fell in love with their LAVA cast iron cookware. I received the LAVA Cast Iron Multi-Purpose Casserole and it’s been phenomenal to cook with. I’ve been making delicious soups, roasts and other yummy dishes and I think it’s one of the best products I own in my kitchen. First of all, I love the colour. It’s a vibrant red which matches my kitchen’s black & red decor perfectly. It’s a good size to make a meal for your family with a 3.4L capacity. In terms of size it’s 28cm (approx 11 inches) and weighs 6.41kg. It’s heavy, but cast iron is supposed to be! 6.41 kg converts to about 14 lbs. 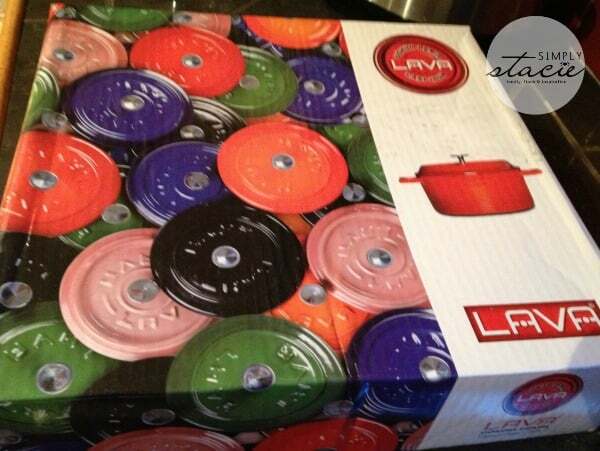 LAVA cast iron cookware is made in Turkey and they have been in business for over 40 years. They use the highest quality cast iron in the world and have a strong focus on producing quality products. None of their products have any harmful additives. They have also licensed enamel technology from a Netherlands based porcelain enameling company, Ferrotechniek. Each piece is covered with the vitreous enamel that allows for durability and versatility in prepping, cooking and storage. It really is a multi-purpose dish because there’s so much you can cook with it. You can make soups, stews, roasts, rice, casseroles, desserts, cakes, quiche, bread, chili and more. Use it on all heating sources (NOT the microwave though!) including gas, electric, induction stoves, etc. You can also even use it for frozen foods and it works well to keep foods cold in the fridge. My stove is nothing fancy….just a regular electric stove with burners. Before I started using LAVA cast iron, I noticed that my food would not cook evenly. I’d always have one side of the pan cooking faster than the other. It was annoying! One huge plus with the LAVA cast iron cookware is that food now cooks evenly. The cast iron helps to spread the heat across the entire cooking surface. That’s one of my favourite features of cast iron. It’s perfect for cooking meats and vegetables and the meals seem to taste so much better. 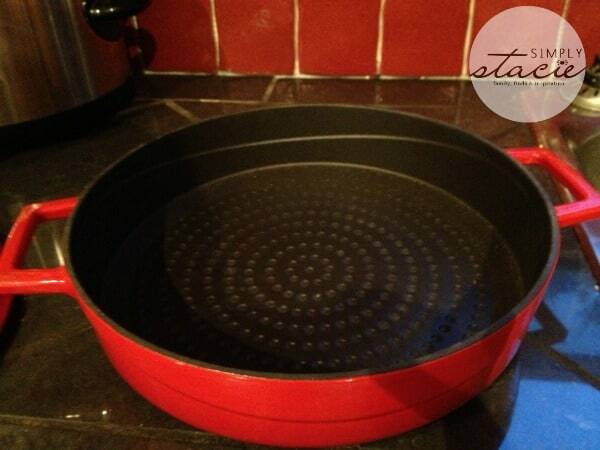 Even the lid on the LAVA Cast Iron cookware has a special design to lock in flavours. Vegetables will have taste like they’ve been roasted and meat will taste grilled. 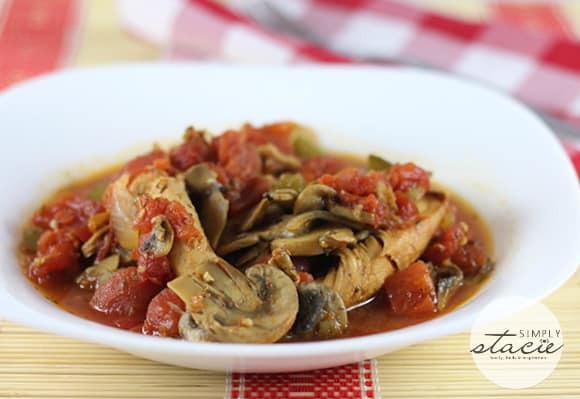 One of my go-to dishes is Chicken Cacciatore because it’s both healthy and delicious. Also, it’s very easy to make. I made up a batch using the LAVA Cast Iron Multi-Casserole and it was the best one I’ve made yet. The vegetables were perfectly cooked and the chicken was so tender and flavourful. I loved how I could make it all in the one pot which saved me time on clean-up. LAVA products are backed by a two year warranty. You can check out the full selection of LAVA cast iron cookware on Cilantro Cooks. There’s a variety of different sizes, colours and types to choose from. This particular casserole that I received is regularly priced at $144. It’s currently on sale on Cilantro Cooks for $129.60. Use the coupon code below to save an additional 25% on the sale price. This is the perfect time to pick up one for yourself or as a holiday gift for a family member or friend. Cilantro Cooks offers FREE SHIPPING on orders over $100 in USA & Canada. With the cold weather coming, I’ll be making a lot more comfort food including roasts, soups and stews. If there’s only one dish you buy this year for your kitchen, let it be this one. You’ll notice a big difference when you cook and you’ll wonder how you lived this long without it! Visit Cilantro Cooks to check out what the LAVA products and see what else they have. Warning: prepare to be amazed by their wonderful selection! Receive an additional 25% off on all LAVA products with the coupon code: SSLAVA25. 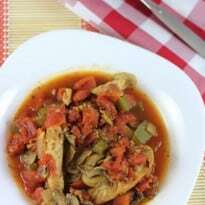 I thought I’d share a simple recipe for Chicken Cacciatore that our family really enjoys. I made this entire dish in the LAVA Cast Iron Casserole. Connect with Cilantro Cooks on Facebook, Twitter, Google+, Pinterest and their blog. A delicious meal with easy clean-up! Heat oil in cast iron pan over medium heat. Add in chicken breasts and cook for about 5 to 6 minutes. Remove from pan and set aside. 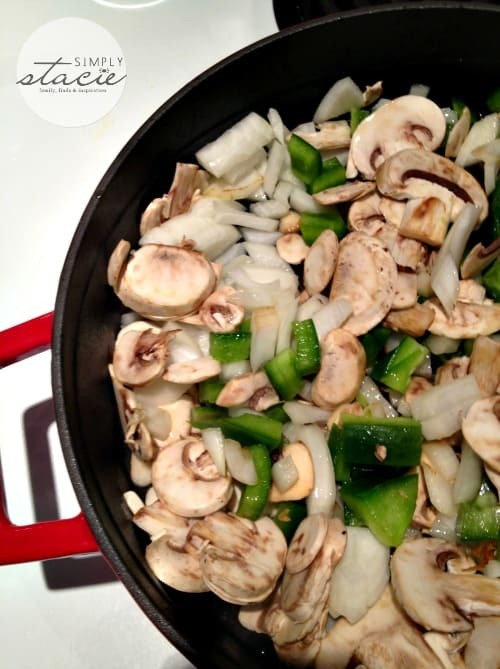 Add onions, green peppers and mushrooms to pan and cook for about 7 to 10 minutes until onions are softened. Mix in Italian Seasoning. 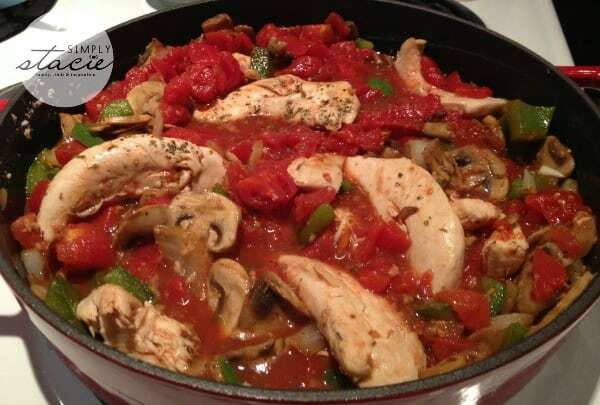 Add tomatoes and chicken to the pan and bring to a boil. Reduce heat to minimum and cover. 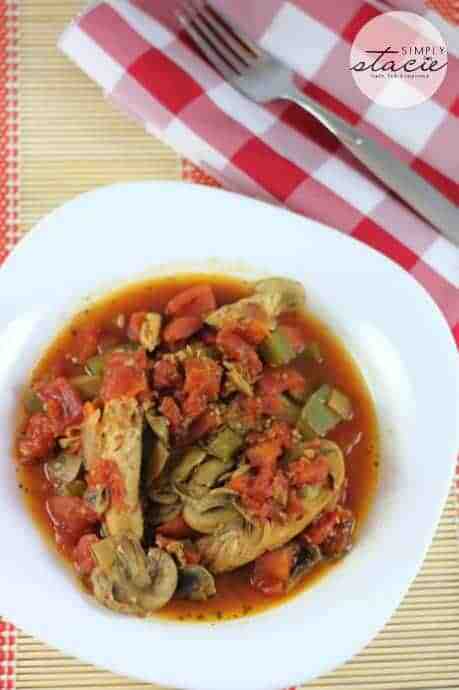 Simmer for an hour or until you’re ready to eat. Serve it on over a bed of pasta, rice or eat on it’s own. What a great website! Love the Nytta Design Party Apron in black as well as soooooooooo many other products! I love the beautiful cutting boards. 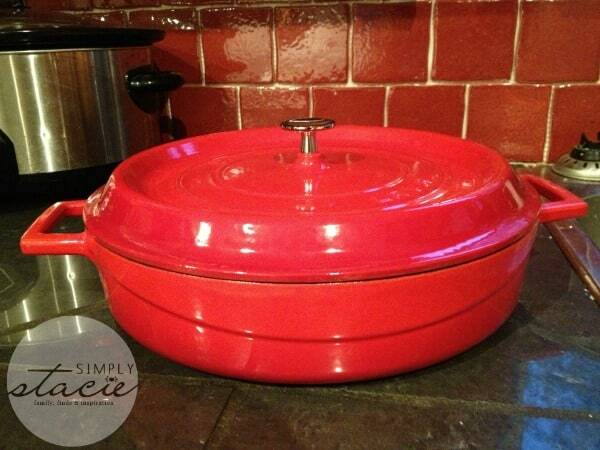 I would love to win the Emile Henry Casserole Dish with Lid so I can make some great comfort food this winter!! Emile Henry Black Pizza Stone looks awesome! I absolutely love making homemade pizza and I could make so many pizzas with this! I like the Lodge Prologic Pizza Pan. Hi Stacie, your little girl is cute, takes after her mom. Thank you for giving this cast iron pan away. I really like the Lodge 11-inch Caribbean Blue Cast Iron Skillet. I would like to have the fox run wok! Sounds like it’s worth trying out! Thanks for another great contest!!!! Thank you for hosting ye another wonderful contest. I would really like to win the Lava cast iron skillet. 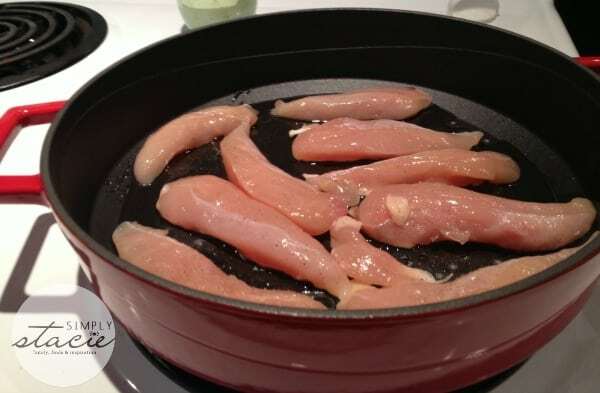 It would be the right pan to make some amazing fried chicken.